Well November is now history, and it looks like December has winter trying to get a foothold on the weather picture. The first two weeks of November were great! Like mild September weather. Managed to get plenty of riding in, from Hardwood, Albion, Kelso, Dundas, and of course our local Waterdown trails. Rode mostly with NewfieSteve, EnglishJim, then also with the Bicycleworks gang. Managed to get 5 rides a week in in this first two weeks. The last couple of weeks in November were a different story. Work schedules for the last two weeks made finding riding time and riding partners somewhat more challenging, so had me doing more solo riding. And the weather took a cold, wet turn. Unfortunately, our local Waterdown trails get very challenging when it is wet. The steep, frequent climbs, abundance of roots and leaves, mixed with the mud turn a good ride into an opportunity to hike your bike or take a spill. FriendlyGord took a nasty spill on a BicycleWorks Wednesday night ride on a slick rooty downhill (after seeing him at the LCBO though, he has recovered nicely). During the wet periods try to ride some of the trails that tend to handle this weather better (Dundas, Puslinch, Oakville 16mile Creek); or resort to riding on the road. Sad to say, even has to hit the trainer a handful of times. The trainer is damn effective, but I have the attention span of a gnat and find the experience of the trainer excruciatingly boring. I need to force myself to stay on the thing just for 45 minutes at a time, so I try to make it intense as possible during that time. Managed to hit the weights a couple of times each week to maintain tone, and strengthen core muscles; and hockey once a week. Managed to stick to the diet well in November...well enough to keep more fat demons from finding their way to my abdomen anyways; and to maintain muscle mass, and keep the energy levels up. Challenges are coming in December though. The weather is turning, (put two new Specialized Captains tires on my bike this week to provide better traction than I had with the Fast Tracks). The holidays are coming and my LCW (Loving Caring Wife) is wanting to bring out the Christmas cookies and treats. Unfortunately I am an extremist...and weak. If a tin of cookies come out I will eat the whole flippin' thing, so I try to avoid looking at, touching, smelling... The same is true with the Cap'n Morgan Spiced, 40Creek, and Glenlivet that tends to find its way out of the liquor cabinet with great frequency this time of year (OK, I am even weaker at avoiding these). Plus, I am headed to my home province of Saskatchewan (taking my 21 year old son with me) for 10 days to touch base with family, which I am lucky enough to have an abundance of, and re-connect with old friends...which will bring a whole host of nutritional challenges, and little opportunity to exercise or ride. Anyways its 8 am on a Saturday morning, and NewfieSteve and EnglishJim will soon be here to go riding at Dundas...so I am off. These are races that are upcoming for 2012. Whether or not they will all fit into my schedule remains to be seen. Also, exact dates have not been set for all of the races yet so there may be overlap where I will have to choose one race over another. 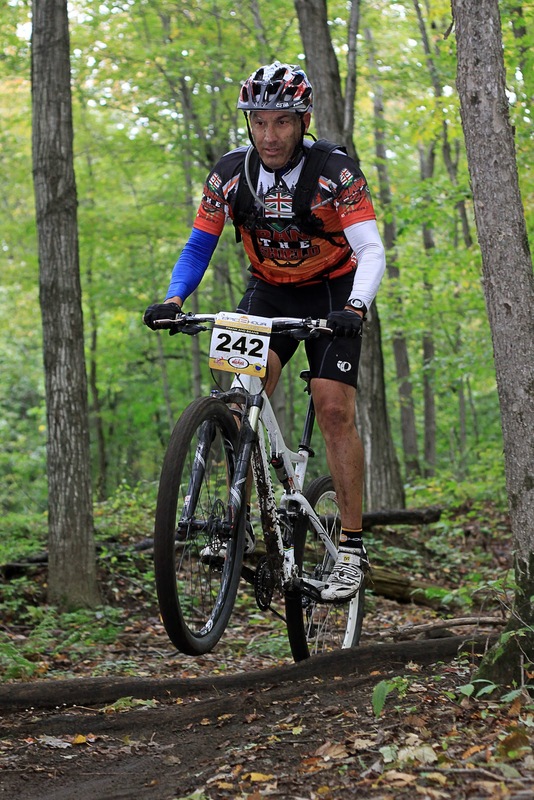 September 15 - Paul's Dirty Enduro. 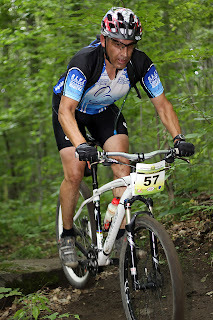 This is a brutally tough 100km race held in Ganaraska Forest. However because of the overlap with the Crank the Shield, I will not participate in this one in 2012. So, those are the major races in my area that I will try to fit into my schedule. Some of our local trails also hold weekly race series, and there are the Ontario Cup races, http://www.chicoracing.com/ , which are all possibilities if or when they fit. My riding partners can basically be broken up into three groups...although the groups will often intermingle during rides. First is the BlueStreakRiders group. This group is predominantly road bikers who also mountain bike. This group really got its start from a group of competitive gymnasts. I originally met a couple of them randomly on the trails (although the running joke is that we met on e-harmony dot com...a less than manly road biker kind of joke), and this is where my nickname (Riot) really got its start. Actually I stole the nickname from my son who used the name for online gaming, as I needed a nickname for the BlueStreakRider web forum. These guys ages range from early 30's to mid 50's and the rides are motivational as hell. There are some extremely fit riders in this group, and riding with them often pushes my endurance levels to the limit! Then there is the Bicycle Works crew. This group includes staff and customers of the shop, http://www.bicycleworkswaterdown.com/ ...and includes both genders, and all ages and skill levels. There are professional athletes in this group. There are the most technically gifted riders in the region, possibly in the Country in this group...and unbelievably fast!!! Keeping up with mid-level riders in this group is a challenge, and riding with the advanced group on group rides makes me realize how much more work I need to do; and motivates me to do just that! So there, you have it. Although, I often ride solo, or run into other riders on the trails, these are the riders I most often end up with not only for the fun and experience, but for the motivation to be better. Ride on! When my buddy first asked me to be on his mountain bike team I had to find a proper mountain bike (I had a 12 year old wanna be bike). So I went out and spent what I thought was an insane amount of money ($1,100) for a used Gary Fisher SugarRace. It was a great bike for racing, it was my partner for falling in love with this sport. It got me through my first mountain bike season. But I am a 200 pounder, and our local trails are some of the most technically challenging anywhere. It was not the bike for this terrain. I ended up breaking the frame. I was devastated. I was now completely hooked on the sport...and no bike. Well, I ventured down to the ATM; then to my LBS, and purchased a brand new Specialized FSR XC. This was a great bike for our local trails (and an outstanding wood finish paint job), but it wasn't a great race bike. I struggled into the next mountain bike race season, and traded it up for a Specialized Stumpjumper 29er hardtail. This was a fantastic race bike! 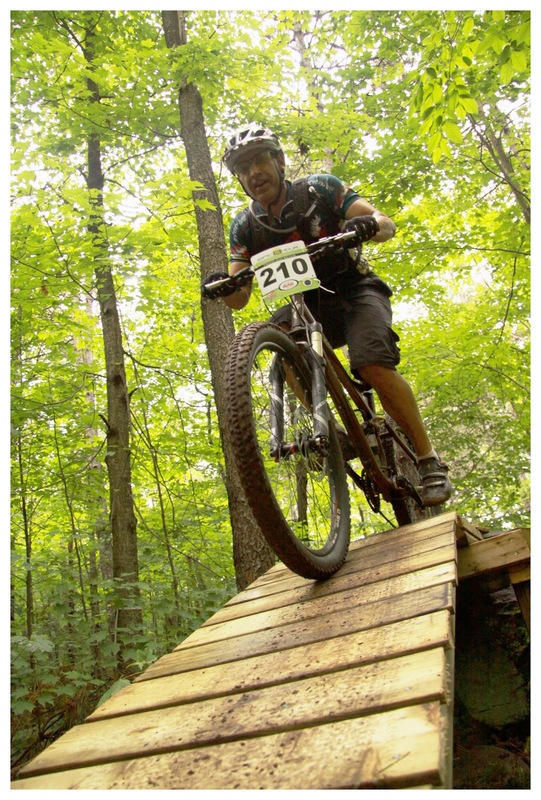 But I am a 200 pounder, and our local trails are some of the most technically challenging anywhere. I ended up breaking the frame. Broke the rear triangle. Specialized honoured the warranty, so with the new frame in at my LBS, I traded it in and upgraded to a Specialized Epic Comp 29er. By this time I had also mashed my way through several stock hubs. According to the folks at my LBS BicycleWorks, I produce a tremendous amount of torque when I ride. This was understandable to me. In my mid 20s I tore up my right knee playing backyard football, in my 30s I tore up my left one playing hockey...both have been reconstructed. But the instructions of the surgeons were to focus on keeping all the muscles associated with the knees strong; and this became a focus of my workouts. I had built up my leg strength to the point where I couldn't stack enough weight plates on the leg press machine to give me a full workout, other gym members would gather around to watch me workout and I would have some of them stand on the loaded machine to add weight. I was up the point where I was leg pressing 3 sets of 12 reps of 1400 pounds on my leg workouts. My thighs, arse, and calves were huge, and the stock hubs that came on the stock mountain bike wheels couldn't take the torque. So now my wheels are upgrades with hubs that are built to take that kind of torque; even though the endurance aspect of this sport has mellowed my leg size somewhat. Apparently it was this torque that led to breaking the Stumpjumper. Anyways the Epic Comp 29er was the perfect bike for our trails, for racing, but...I torqued the rear triangle in two again. Again, Specialized honoured the warranty (have I mentioned how much Specialized has more than earned my respect, and loyalty?! ); of course this also involved Paul and Jim at BicycleWorks representing me well to Specialized. So another warranty, and I again took this as an opportunity to upgrade my bike; this time to the Specialized Epic Carbon Expert 29er. Earlier this race season, about 15 kilometres into a 70 kilometre race, powering up a steep, switchback with a logover in the centre of it, I snapped the chainstay in the middle of the drive train side. Snapped it clearly in two; the only thing holding it together was the shift cable. However, once again BicycleWorks and Specialized honoured the warranty, and replaced the chainstay. The black chainstay doesn't quite match the red and white bike, but it looks very cool. So that is what I am currently riding...I also broke down and bought a road bike this spring to help with my training. A Specialized Roubaix. I am not at all a fan of roadbiking, but I cannot say enough about what it has done for my endurance levels!! So I have progressed from thinking spending $1,100 on a bike was ridiculous to having a bike that is worth more than the car I carry it on. And to top it all off, now I am saving up my dollars to hopefully upgrade to the 2012 Specialized SWorks Epic 29er when they come out in the spring; the ultimate race mountain bike. Gonna take a lot of training to make it worthwhile....stay tuned. So it is the middle of November; race season is predominantly over until April. At this time of the year I ride more for pleasure while trying to maintain a decent fitness level and keep the fat off. I try to keep under 10% body fat at this time of year, and get down to 5% for race season. Ideally, I would ride twice a day if life would allow it. Generally, I try to get in at least 3 -5 rides per week. Most rides tend to be approximately 25 kms. I have a road bike on a trainer at this time of year, for days that work, family, or weather don't allow me to get out. I resisted getting a road bike until this spring when consistently wet weather made the trails unrideable for extended periods. This turned out be the best thing for my endurance!! So during spring and summer, I try and add two road rides per week to my training schedule. And I try to get a weight work out in a couple of times a week to maintain muscle mass, tone, and to maintain a strong core. Finally I play hockey once a week. Can't give up the hockey; as a staunch prairie Canadian it's in my blood. Been playing since I was 6 years old. I am often asked, how do I find the time for all this?? It helps that I am self employed and, for the most part, have some control over my work hours. I also have a very supportive spouse who understands my passion for this sport, and has been witness to my dedication and improvement to it in the last 3 years. My kids are all over 18 years old and independent. We have a tremendous amount of local trails in the area (more fodder for a future post). The truth is, you set your priorities, and do what you have to do to achieve them. And I am at the point in my life where I can take the time and effort to make mastering this sport a goal. Truly, if the MTB companies were smart, they would direct way more of their marketing efforts and dollars towards my age category. As far as nutrition goes I generally try to maintain a ketogenic diet (let's see if this creates any controversy! ), and try to avoid processed foods as much as possible. I will include carbs in my diet on race days, in my pre-race meals, during the race, and in my recovery meal. My race day meals are carefully measured, based on my experience with experimenting and results. Also during particular taxing work outs where I feel my energy levels waning I will toss back a pack of Sharkies Organic Energy Sports Chews; they are much more easier on my stomach than gels and taste like candy. I will include more details on my nutrition plan in an upcoming post. Nutrition is a huge part of this sport, and it is so important to find what works for you. I have begun working with a professional nutritionist; Theo Phillips at http://www.foodtofit.ca/. My experience with nutritionists and dietitians is that they have always stuck to old school science which is outdated and ineffective (don't even get me started on our great Canada Food Guide!). Theo is very modern, progressive, works with athletes, and understands their nutritional needs, and is willing to try new things. Another helpful friend is Darrin Robinson at http://www.timetoemerge.com/. Darrin is the best personal trainer on the planet. On December 2003 I weighed in at over 240 pounds and over 30% body fat. By April 2004 Darrin had me at 185 pounds and 5% body fat. I am currently weighing in at 195 pounds. If you are in the GTA you need to check him out. Then there is my local bike shop (LBS) at http://www.bicycleworkswaterdown.com/. Craziest fools I have met, but the best riders in the area. Their technical MTB skills are off the charts, they are fast, and so fit riding with them makes you better, and makes you want to be better. Of course, I also get the best deals on bikes, accessories, and organic beef (yup there's a story) there. And there is always a warm coffee. So that sums up where I am at. At least my fingers are getting sore from typing, work is calling; so is a trail. Welcome to RiotOnRacing, and thank you for taking the time to discover what I am all about. So let's get right into it. I am a 48 year old (as of 2011) male competitive cross country mountain biker, with a full time day job. 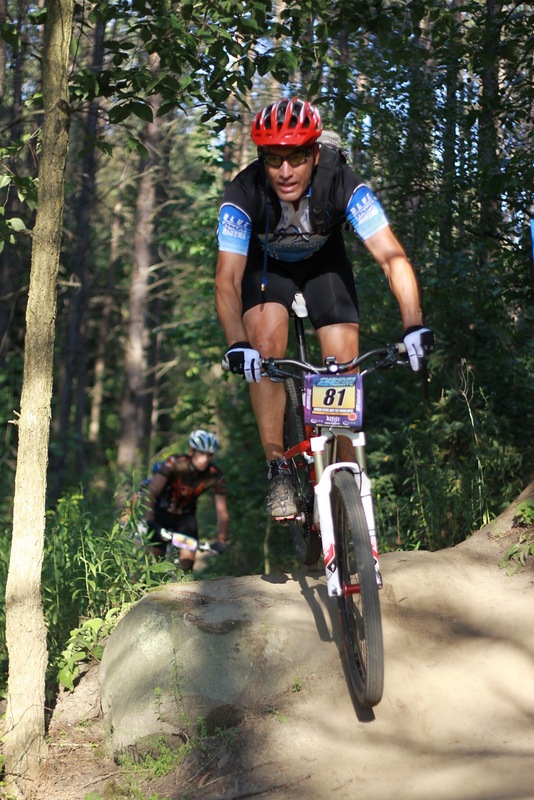 I was introduced to the mountain bike race scene 3 years ago, when a fellow hockey player asked me if I would be interested on filling in for a missing racer on his 5 man team for an upcoming 24 hour mountain biking relay race. I was immediately hooked on the sport. Besides working the day job, playing hockey at least once a week, and family (4 mostly grown children and a mostly grown spouse), I have spent the last 3 years learning and attempting to improve at the sport of mountain biking. I have been working at increasing both my fitness and skill levels, while trying to participate in as many races as possible. I live in southern Ontario, Canada (originally from Saskatchewan, moved here in 2000 for work), and race locally. A degree in Kinesiology from the University of Regina gives a knowledge base regarding nutrition, and maintaining fitness (okay it is from 1984 but I do try to keep somewhat current). 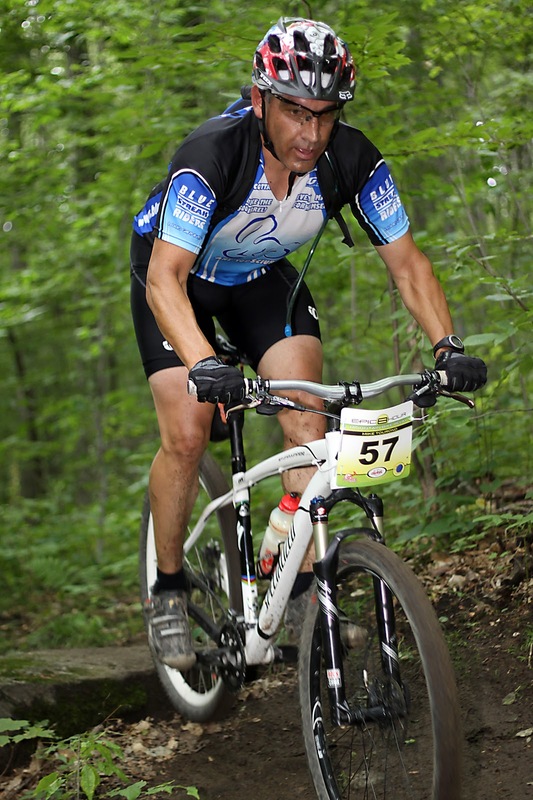 I have been involved in sports all of my life, playing mostly ice hockey (goaltender), dabbling into other sports now and then, and now putting focus on mountain biking. 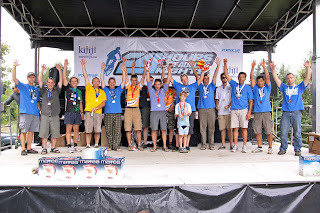 Over the last 3 years of learning the sport, I have participated in point to point races, relay races, stage races, as a solo, and as a team member. 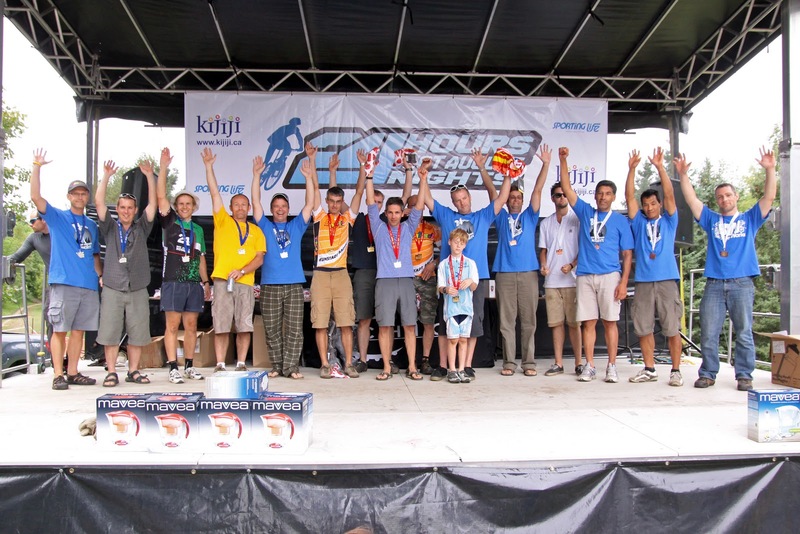 Summer of 2011 saw me earn my first podium finish, as a member of a 5 man team in a 24 hour relay race (Hot August Nights at Albion Hills run by Chico Racing). So...my goals for 2012 are to be consistently in the top 5 in my category for each race, and in 2013 to be a consistent podium contender. The intent of this blog is to keep a log of my strategies regarding nutrition, fitness improvement, riding schedule, and race strategy. Hopefully it is motivational for both of us. I invite you to join me on my journey.